Sensational case of lawyer’s slaying ends with life sentence | Russian Legal Information Agency (RAPSI). MOSCOW, May 10 – RAPSI. The sensational case of the daytime slaying of human rights lawyer Stanislav Markelov and Novaya Gazeta journalist Anastasia Baburova has ended after two months of court proceedings. A life sentence was given to Nikita Tikhonov, a historian, journalist, nationalist and Slavophile, whom the Moscow City Court found guilty of double homicide. Alexander Zamashnyuk, the presiding judge, gave him the maximum penalty. Tikhonov's common law wife and accomplice Yevgenia Khasis was sentenced to 18 years in prison. Markelov and Baburova were returning from a press conference on Jan. 19, 2009 in Moscow when a tall man with a hat pulled down over his eyes accosted them. He shot and killed Markelov and fatally wounded Baburova. He then fired another shot at pointblank range into the lawyer's body lying in the snow. Early on in the case, the investigators concluded that Baburova was an innocent bystander who simply fell victim to being in the wrong place at the wrong time. Consequently, they decided to focus their energy on finding the perpetrator by looking more closely into Markelov's work. Media soon reported a possible “Chechen trace” in the killing, as Markelov had represented murdered Chechen Elsa Kungayeva's parents and worked with human rights activist Natalia Estemirova. Law enforcement agencies also reported other possible scenarios for the murder. However, according to the case files, the investigation had not only opted for a priority line of investigation in April, but already found their suspect in the case. Alexander Tikhonov, a former intelligence officer and one-time senior executive in a number of oil companies, was summoned for questioning and asked to answer questions about the whereabouts of his son Nikita, an expert on Chechen separatism in the early 1990s. The investigation performed surveillance in Tikhonov's rented apartment for an extended period of time using hidden cameras. For the moment, the exact scope of the investigation is unknown, as not all the operational materials have been declassified. This surveillance led the investigation to the second suspect – Tikhonov's common-law wife Yevgenia Khasis. A study of the evidence suggests that Tikhonov and Khasis belonged to a conspiratorial nationalist terrorist group. Shortly before their arrest, they had also discussed killing anti-fascist movement leaders, Sergey Golubev, the leader of the Blood and Honor group, told the court. Golubev said Tikhonov was the author of the so-called “Strategy 2020,” which set the goal of bringing nationalists to power in Russia through terror. Golubev added that Tikhonov initiated the creation of the Russian Nationalist Militant Organization and intended to lead terrorist operations against government officials and the leaders of anti-fascist movements. Tikhonov and Khasis denied their guilt in court and showcased their “indomitable spirit” and mutual affection to the jury. Tikhonov claimed that he went underground out of necessity after the launch of the investigation into the Riukhin case. After Tikhonov's arrest, the investigation dropped the charges against him in Riukhin's murder due to a lack of evidence. 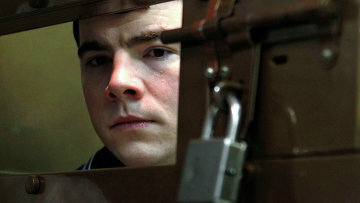 Tikhonov told the jury that his status as a fugitive had forced him to leave journalism and embark on a criminal path. Having no livelihood and believing he could not prove his innocence, Tikhonov said he started selling old weapons to his friends involved in historical reenactments. “I committed a crime and I am ready to bear responsibility for it,” he stressed repeatedly in relation to the illicit arms trafficking accusations against him. Tikhonov called himself a staunch conservative, and his father told the court that he considers his son a Slavophile and a patriot. The court did not investigate Tikhonov's religious views, thus leaving unconfirmed media reports that he is a pagan. An affiliation with paganism has proved a common trait among many neo-Nazis accused or convicted of murder in Russia. Tikhonov's partner Khasis did not hide her membership in the Russian Verdict nationalist organization. She referred to the group as a human rights organization and its activities as human rights activism. Indeed, Russian Verdict Coordinator Alex Baranovsky attempted to provide Khasis with an alibi in the final stages of the trial. The version provided by the investigation, which without any material changes served as a basis for the jury's verdict and the court’s sentence. Thus, the investigation asserted that Tikhonov killed Markelov as revenge for his involvement in the Riukhin case. The prosecution was convinced that Markelov called for the arrest of both Tikhonov and his friend Alexander Parinov, who the investigation now believes was also involved in Markelov’s murder. While the investigation identified Tikhonov as the perpetrator, Khasis was charged with complicity in the killing as part of an organized group. CCTV cameras, as noted in the case materials, recorded “a person who looked like a woman” standing across the street from the place of Markelov’s and Baburova's death for about an hour, and hurrying away immediately afterward. The girl managed to hide her face from the cameras. However, according to the verdict, a number of witnesses and the jurors themselves identified the woman as Khasis. Judge Alexander Zamashnyuk emphasized at the sentencing that Tikhonov and Khasis were also found guilty of conspiracy to commit murder. Therefore, regardless of their roles in the murder, they would each share equal responsibility. At the same time, the investigation dropped the murder charges against Khasis in relation to Baburova’s killing, as her slaying was likely a spontaneous decision on Tikhonov's behalf to liquidate a dangerous witness. During the hearings, the jury heard 20 witnesses, studied the evidence, listened to recordings of the defendants’ conversations and watched recordings from the hidden cameras installed in their apartment. Two witnesses identified Tikhonov as the murderer. One witness identified Khasis as a “nice” girl who “acted strangely,” while standing across the street from the crime scene. The surveillance data revealed that Tikhonov and Khasis discussed Markelov’s murder. Expecting they would appear on the radar as suspects, they also planned an armed resistance to the arrest. Law enforcement officials found the murder weapon in the defendants' rented apartment – an FN Model 1910 semi-automatic pistol. During the search, investigators also found an impressive arsenal of firearms, ammunition and explosives, as well as forged documents. Ilya Goryachev, the leader of the legally recognized Russian Way nationalist organization, gave evidence during the investigation that Tikhonov and Khasis were to blame for Markelov’s murder. After the hearings commenced, Goryachev issued a statement saying he was allegedly pressured by the investigation and withdrew his deposition under this pretext. Tikhonov put the blame on Goryachev in court for keeping the pistol Tikhonov used to shoot Markelov and Baburova. The defendant argued that Goryachev gave him the murder weapon eight months after the offense and two weeks before his arrest. However, the court was unable to verify the information, as Goryachev did not appear for questioning. This is a brief list of the evidence gathered in the case that served as the basis for the verdict. The jury found the defendants guilty of Markelov’s murder and illicit arms trafficking. Tikhonov was also found guilty of Baburova’s murder and using forged documents. The jury did not consider the defendants deserving of leniency. Prosecutor Boris Loktionov said in his post-verdict statement that the defendants committed a cynical, socially dangerous crime and intended to continue their illegal activities. Baburova's parents and Karpinsky supported the prosecutor's position. “I believe both Tikhonov and Khasis should be given the severest punishment,” Karpinsky said. After the hearings, the defendants and their lawyers impugned the court’s credibility and demanded a retrial. The defense argued that the jury had allegedly been pressured and one lawyer had been removed. The defense also questioned the presiding judge’s impartiality. “What I want to tell people, I will say in another place, at another time,” Khasis declared cryptically. At a previous hearing, she had promised to “speak out” in five years. The defense's motion for a new trial was rejected. The lawyers may also file a similar motion to the Supreme Court as they intend to appeal the verdict. 11:55 10/05/2011 The sensational case of the daytime slaying of human rights lawyer Stanislav Markelov and Novaya Gazeta journalist Anastasia Baburova has ended after two months of court proceedings.